Modeling Jobs>Time for Print>Female Models Required for Bay of Plenty Alt Photo Book Project. Models required for new alt photo book project. Models will be required to do their own makeup and hair. Clothing will be supplied and will be mostly catsuits in PVC, leather or latex. Its TFP so models will be offered a complimentary shoot of their choice for new profile images. Week days are preferable. Dates by booking. Ongoing project. 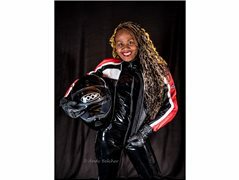 Modelling in leather motorcycle gear.